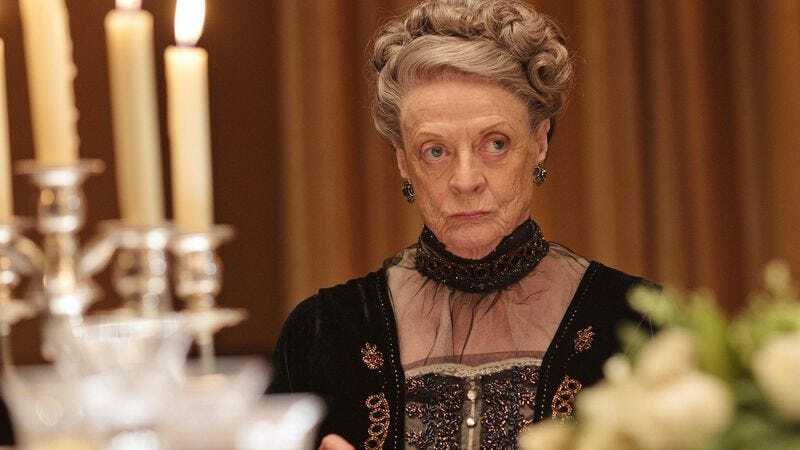 Notorious bad girl Maggie Smith, the Charlie Sheen of British costume dramas, has revealed that she plans on leaving her series Downton Abbey in the lurch after next season, selfishly looking to pursue her off-screen antics of gracefully growing old. “They say this is the last one, and I can’t see how it could go on,” Smith told The Sunday Times, referring to speculation that the show might end after its sixth year. But whether Downton continues beyond that to answer its lingering mysteries—such as whether Mary will find another man to overlook how awful she is and what’s taking so long with the pudding—it will no longer have Smith’s Dowager Countess around to make gasping noises at haircuts. “I mean, I certainly can’t keep going. To my knowledge, I must be 110 by now. We’re into the late 1920s,” Smith said, previewing next season when Cousin Rose and Lady Mary become fully ensconced in England’s Bright Young People debauchery, and the Dowager Countess emits a long string of disapproving drool. Smith’s interview once more confirms that, even if Downton Abbey were to end, you could just follow her around pointing modern things out to her and get pretty much the same enjoyment.